What’s It Gonna Take For Somebody To Win A Chess Game? Yes, it’s still tied at the World Chess Championship. Game 5 of the World Chess Championship began under a cloud. Not a literal cloud, though there were those in London, too. Rather it was the lingering hubbub of a published and deleted video. Since that video was released, a prominent chess writer resigned and, oddly, the event’s organizing body announced that it had hired a security firm that was ready to sweep for illicit electronic devices and deploy polygraphs on the players if necessary. Was the latter related to the video? To some other bit of intrigue yet to fully emerge? Or just because chess’s governing body is, how do you say, filled with plenty of intrigue of its own? I have no answers for you. But I do have some chess to relay. To catch you up if you’re just joining us: Magnus Carlsen of Norway is seeking his fourth world title. His challenger Fabiano Caruana of the U.S. is trying to become the first American world champion since Bobby Fischer in 1972. The pair began the day’s game tied 2-2 in the best-of-12 title match.1 It didn’t end much differently. Caruana’s sixth move — his white pawn to b4 — electrified the encounter. This is what the board looked like after it struck. This is a rare move in this position at the game’s highest levels, and it’s an aggressive one — one often reserved for speed-chess games, rather than the lengthy, classically timed games of a world championship. Carlsen had faced this move with the black pieces only once before, according to ChessBase — in a 2005 game against the Dutch grandmaster Daniël Stellwagen, when Carlsen was just 14. (That game ended in a draw.) Given Carlsen’s prodigious memory for positions, it would be no surprise if he remembered that game well. And he claimed not to be troubled. “To be honest, I was pretty happy about the opening,” Carlsen said after the game. Lichess’s analysis tool calls that sixth move the “Sicilian Defence: Nyezhmetdinov-Rossolimo Attack, Gurgenidze Variation.” Gurgenidze was the Georgian grandmaster Bukhuti Gurgenidze, and “one of the most original and striking players of the Soviet era,” wrote ChessBase upon his death in 2008. The early part of Thursday’s game was striking, too. Grandmasters called it the sharpest opening they’d seen in world championship history. Generically, this sort of move, a pawn to b4, is called a wing gambit, and it can be ventured in a few different openings. White sacrifices a pawn to potentially gain an advantage in the center of the board and in the mobilization of his pieces — the claiming of territory and the arming of his troops. Indeed, it was perhaps the first time in the match that the player with the white pieces had been able to sustain anything one might be able to call an attacking advantage. Yet Carlsen was able to parry the threats. He appeared calm throughout the game, occasionally throwing one arm over the back of his chair, ever so suave in his gray suit. By Caruana’s 19th move, he was perhaps regretting that his brief advantage had fizzled. And indeed it had. He spent nearly 32 minutes on that move, head often in both of his hands, pondering the board. Carlsen and Caruana agreed to a draw after 34 moves and just over 3 hours, in the position below. The match now sits level, 2.5-2.5. 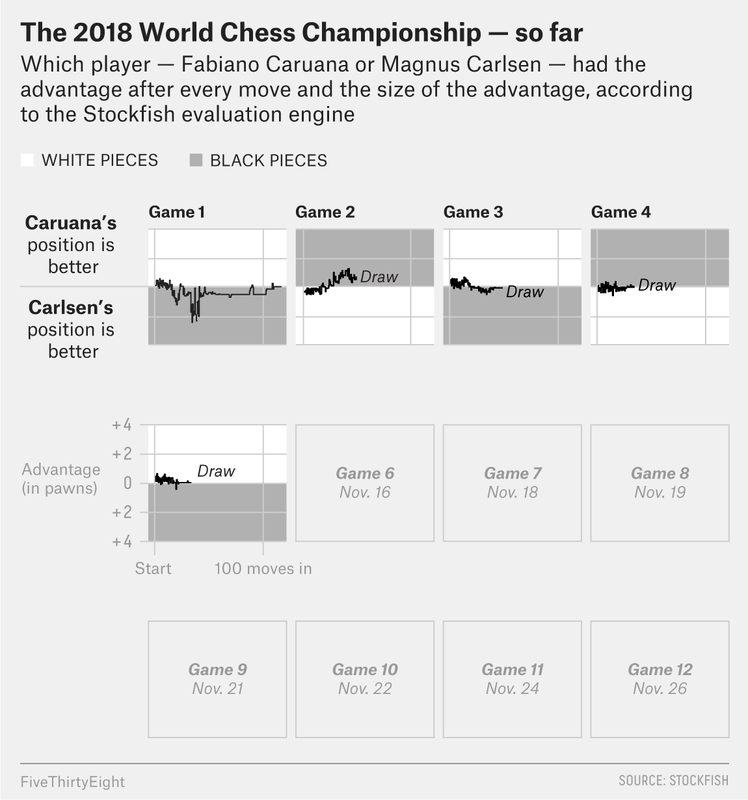 Given the way the championship’s scheduling works, Carlsen will play with the white pieces — and its first-move advantage — for the next two games. It will prove a critical gauntlet for Caruana’s title hopes. Here’s a visualization of how things have gone, and we’ll keep the chart below updated throughout the match. Game 6 begins Friday at 3 p.m. Greenwich Mean Time — that’s 10 a.m. Eastern. I’ll be covering it here and on Twitter. Wins are worth 1 point, draws 0.5 and losses 0.